At dawn, I sat by the Pacific in Oceanside, CA. preparing to take my first steps in what would become a 3,000 mile cross-country walk for peace. This pilgramage would be the most physically demanding activity I had ever done. My heart was in this, all the way, though I wasn’t sure what my knees would think of this plan. They invited me into their home for dinner and a welcome shower. Later, Wayne put me in touch with LOWA Boots, who graciously donated a pair of walking shoes for my Peace Walk. Things improved the moment I tried on these shoes. They felt as if they were made specifically for my feet. My LOWAs remained comfortable all along my path, throughout the summer. I walked over 2,000 miles that summer. 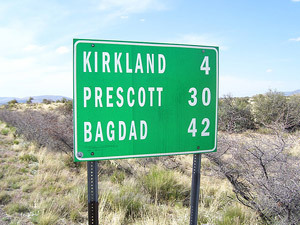 Through California, into the desert southwest and on to Kansas. I took a break from my walking in Greensburg, Kansas, to do volunteer work, helping these residents get back on their feet. Greensburg is the small town that was nearly wiped out by a tornado just a few weeks before I arrived. 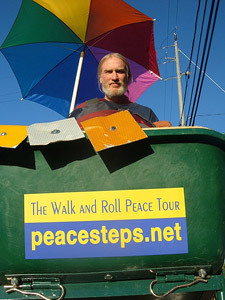 From there, I walked alone to Illinois, joining up with a peace group of marchers, like myself. We spent the next 5 weeks together, walking to Washington, D.C.
My LOWA walking shoes were my constant companion during this epic summer. The wear I put on those shoes was heavier than anyone would put upon a pair of walking shoes. They held up for then entire 3,000 miles and were comfortable from beginning to end. A new pair of LOWA walking shoes will be on my feet this summer, as I set out on Peace Walk II, trekking from Mexico to Canada along the Pacific Coast. LOWA makes a superior product, no doubt about it. I will be a customer forever, and there's no doubt about that either.